On the day of my program holiday party we also got an actual, legit snowfall. 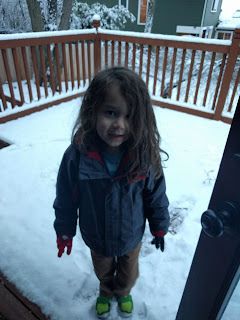 Pretty sure this was Mal's first snow that stuck to the ground and accumulated decently. We've definitely had dustings before, but nothing you could make a snowman, or even a snowball, with. 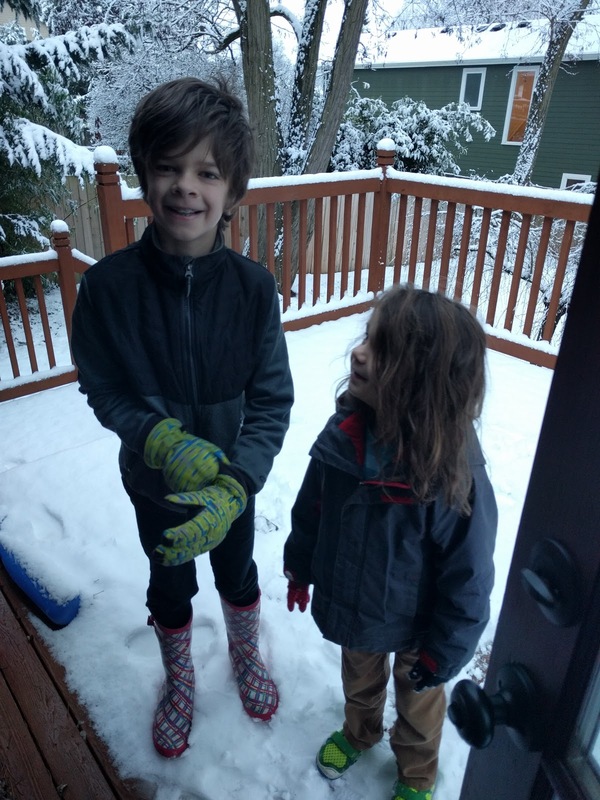 It didn't start snowing until late Thursday night and was supposed to turn to rain overnight, so I was worried the kids wouldn't get any fun out of it at all. Some friends even woke their kids up to go play in the snow that night. I'm no fun, so we didn't do that. But that worked out because the snow was still around in the morning and Gareth even had a delayed start, so they got to play in it a bit. Mal eventually discovered that cotton gloves aren't great for playing in the snow. He started crying when his hands got cold, so they came in and I gave them hot chocolate (which made it "the best day ever!" according to Gareth (but he also said that about the last day of school before winter break and several other days recently, so it's become rather meaningless)). And I dug out Mal's mittens that I purchased last year that actually keep the wet out somewhat. He got to head out again as Gareth was heading off to school. By which point it was starting to rain a bit. With a big redwood in our back yard, lots of the yard didn't have much snow at all. 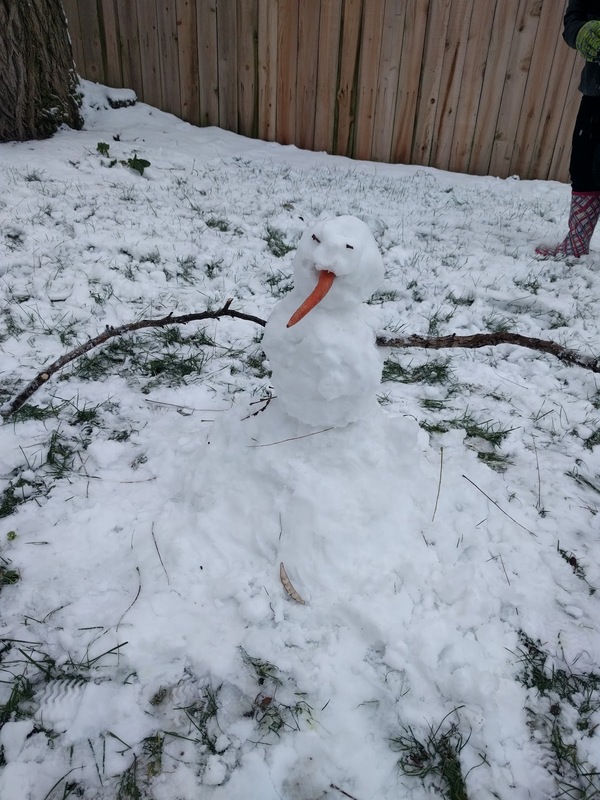 And due to his lack of snow experience, Gareth has no idea how to actually make a snowman. 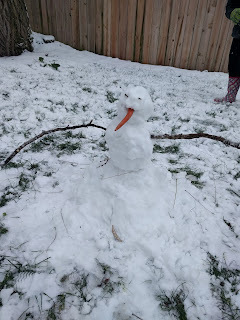 But the boys were both very excited about this attempt, so I wasn't going to knock it because, hey, I didn't have to be out in the cold making it. By the end of the day most of the snow was gone, which was good since we had the party that night to go to and icy roads are not something I'm fond of. 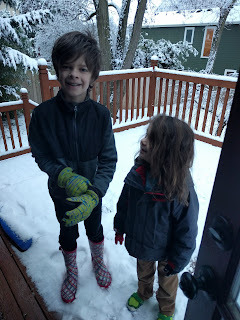 The boys would love to get more snow this year, I'm sure, but I'm good with what we've got.